Rated at 3,000 to 4,500lbs. Komatsu’s FR Series of narrow aisle reach trucks feature new and innovative engineering ideas that show Komatsu’s commitment to conserving our environment and reducing your overall cost of ownership. AC drive and hydraulic controls offer smooth and efficient control of critical truck functions while giving you the extended run times and improved truck efficiencies. The rugged and heavy-duty mast and pantograph mechanism are built to handle the toughest work cycle. 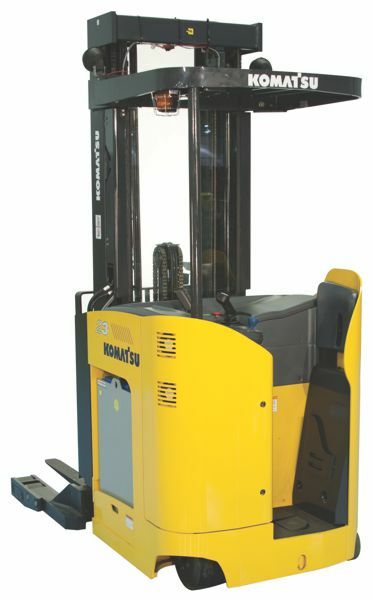 The Komatsu narrow aisle reach truck has a low step height, spacious cushioned floorboard and ample padding for greater levels of operator productivity while remaining alert and ready to work. The side-stance operator positioning provides maximum visibility for both loading and directional travel. The short steer arm and electrical steer-by-wire technology offer effortless maneuvering along with the multi-function control handle for speed and hydraulic functions. Oil flow is accurately measured and infinitely controlled through a combination of the truck controller and the proportional control valve. Infinitely variable hydraulic control speed allows for smooth, full-feathering of hydraulic movements as well as minimal shocks, making the FR series idea for handling sensitive and fragile materials. An electric disc brake system on top of the drive motor armature shaft provides for smooth and consistent stops when releasing the brake pedal. The operator steps down on the rubber cushioned, floor mounted brake pedal and electrically releases the brake. When the operator steps of the truck, the raised pedal automatically applies the parking brake. The KICS AC control system has an advanced technology AC drive motor and an AC hydraulic motor to achieve high performance with minimal costs. The AC motor eliminates the need for motor brush checks or replacements and provides high operating efficiency for longer run times than conventional DC type motors. FR Series models feature a start-up diagnostic system at power-on to check all major components and systems prior to unit operation. The control system has a built-in analyzer that can provide feedback on fault detection and other diagnostics. Other simplified maintenance include: easily removable lift-off panels, swing-open side door for drive motor and brake access, bolt-on outrigger toe boxes and frame cut-out for easy tire replacement. The Komatsu FR Series uses tested and reliable components to reduce your overall cost of operation. The three stage mast and reach carriage features a rugged design that will deliver dependable service for the long haul. Mast features include: interlocking channel and I-beam design, hydraulic cushioning with the retract function for fragile load protection, and welded outriggers to the mast outer channel for added strength and support. A keypad on the dash communicates truck settings and on-board diagnostics. Truck performance settings can be adjusted through the keypad to achieve optimal performance parameters for your application needs. The keypad also displays state-of-battery charge, time of day and travel speed.